The opening day of the Specsavers County Championship match between Sussex and Durham at Hove was falling asleep in the warm spring sunshine when controversy injected some life into proceedings. Both these sides were considered to be among the strongest three or four counties in the second division at the start of the season but, for different reasons, find themselves at the wrong end of the table. And it looked very second class cricket at times. The Sussex bowling was ordinary, despite the return of Vernon Philander and Chris Jordan, and their fielding, which has been indifferent all season, was even more accident prone than normal, with at least four catches going down. But the Durham batsmen, perhaps surprised to be put in under sunny skies, were not good enough to make the most of their good fortune. The incident happened shortly after tea, as Ryan Pringle and Paul Coughlin featured in a rescuing sixth wicket stand. They managed to stave off the Sussex bowlers without actually dominating them, and put on 110 before Pringle was caught behind for 60. But a short while before that Pringle, on 51, flicked Jordan to long leg, where David Wiese appeared to take a fine running catch, with the ball well off the ground. But Pringle did not walk and umpires Graham Lloyd and Ben Debenham decided not to give the batsman out. The Sussex fielders protested but neither batsman nor umpired changed their mind. Ryan Pringle said: “I saw the square-leg umpire shaking his head. I wasn’t standing my ground to say ‘I don’t think you caught that.’ The umpire was signalling that he didn’t think he caught it. The umpires had a chat, I stood my ground and they gave it not out. “If you get hit on the leg you’re not going to walk off for an lbw. It’s the umpires’ decision at the end of the day. I wasn’t trying to influence the umpires’ decision, which maybe a couple of their players thought I may have done, by insinuating he hadn’t caught it by standing my ground. But I saw the umpire shaking his head. A couple of their guys said they would have stood their ground. After that Sussex appeared to raise their game and Durham lost their last five wickets for 48 runs. 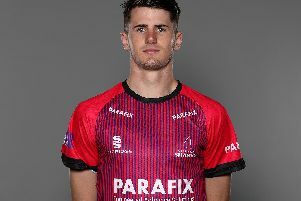 But Durham would not have got close to that if Chris Nash not dropped two straightforward catches at second slip; Michael Burgess missed another behind the wicket and Joffra Archer put down another at long leg. At least Archer redeemed himself with figures of five for 76. Durham were going well on 72 for one but then lost three wickets in as many overs just before lunch to go to the break on 90 for four. Two of the late wickets went to Philander, the first of his Sussex career – he was injured in his debut game against Kent last month. First he dismissed Cameron Steel, a soft dismissal caught at square-leg, before he had Stephen Cook lbw for 45 in his next over. Then Archer, who had taken the first Durham wicket when he removed Keaton Jennings off-stump for 12, struck again when he had Paul Collingwood lbw for nine. Danny Briggs came on at 129 and struck with his first delivery when he had Graham Clark lbw for 23. Then came the reviving and controversial stand between Coughlin and Pringle.